Winchell Thoroughbreds and Three Chimneys Farm's Gun Runner, last fall's Clark Handicap Presented by Norton Healthcare (Grade I) winner and runner-up to Arrogate in March's Dubai World Cup (GI), breezed five furlongs in :59.80 Monday morning at Churchill Downs in preparation for a probable start in the $500,000 Stephen Foster Handicap (GI) on Saturday, June 17. Gun Runner, with regular rider Florent Geroux aboard, started two-lengths behind workmate Tapsolute and finished about one length in front at the wire, according to Churchill Downs' official clocker John Nichols. The Steve Asmussen trainee breezed through fractions of :12.20, :24.20, :36 and :47.80 before galloping out six furlongs in 1:12 and seven furlongs in 1:25.20. 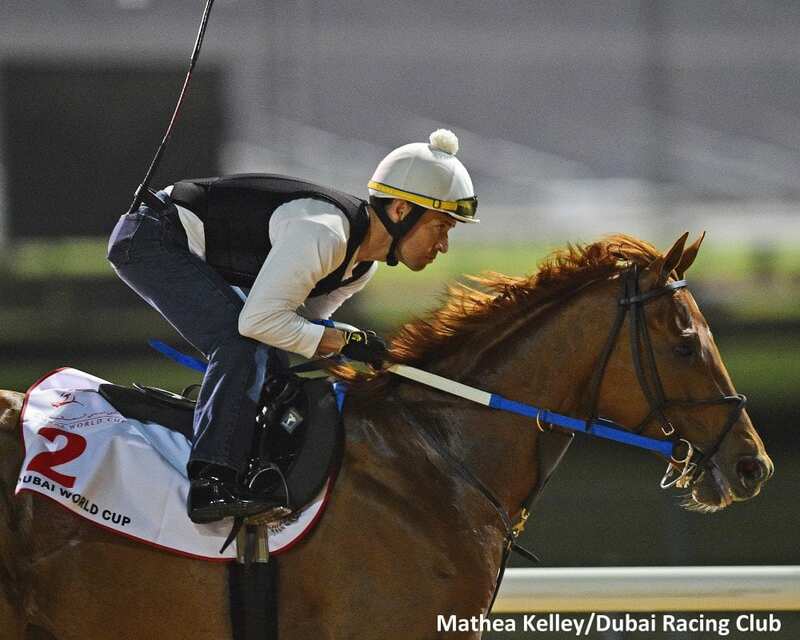 “He's an awesome horse,” Asmussen said. Asmussen and Geroux both had late nights Sunday as they were traveling back to Louisville for Gun Runner's breeze. Asmussen was in Grand Prairie, Texas to saddle Neck 'n Neck (fourth) and Carouse (fifth) in Sunday's Lone Star Park Handicap (GIII) and arrived back in Kentucky at 10:30 p.m. (all times Eastern). Geroux, who rode Souper Tapit to victory in Sunday's Marine (GIII) at Woodbine in Ontario, Canada, landed in Kentucky around 12:30 a.m. Gun Runner has a 14-7-3-2 record with $4,337,800 in earnings. The 4-year-old son of Candy Ride (ARG) has fared well over the Churchill Downs surface including a third-place finish in the 2016 Kentucky Derby (GI) and victories in the Matt Winn (GIII) and Clark Handicap (GI). Gun Runner will attempt to become the third horse to win the Clark Handicap and Stephen Foster Handicap – Churchill Downs' signature races for older horses. Hopeful Word accomplished the feat in 1985-86 and No Marker completed the double in 1989-90. The Stephen Foster Handicap is the Breeders' Cup's first U.S. “Win and You're In” for the $6 million Breeders' Cup Classic (GI), which means the winner will receiving an automatic berth to the 1 ¼-mile race onNov. 4 at Del Mar. Along with the Stephen Foster, the June 17 Downs After Dark program at Churchill Downs will feature the $200,000 Fleur de Lis Handicap (GII), $200,000 Wise Dan (GII), $100,000 Regret (GIII) and $100,000 Matt Winn (GIII). The Fleur de Lis also is part of the Breeders' Cup “Win and You're In” Series with the victor receiving an automatic berth to the Breeders' Cup Distaff (GI) on Nov. 3 at Del Mar. Both the Stephen Foster and Fleur de Lis will be televised on NBCSN from 8:30-10 p.m. as part of the 2017 “Breeders' Cup Challenge Series: Win and You're In, presented by Lane's End Farm and America's Best Racing” television schedule. This entry was posted in NL List, Racing and tagged candy ride, churchill, churchill downs, clark handicap, dubai world cup, Fleur de Lis Handicap, Florent Geroux, gun runner, Stephen Foster Handicap, steve asmussen by Press Release. Bookmark the permalink.